We have learnt quite a bit about 3d printed prosthetics and how they can be created easily and inexpensively. Just like prosthetics and a lot of other things, 3d printing can be used to print another very commonly used assistive technology device – hearing aids. However, what is the reason for someone to consider 3d printing when so many other hearing aids are readily available? It all comes down to autonomy and full control of what the hearing aids should look like and what they should do. Assistive technology devices have, for a long time, been notorious for lacking aesthetics, style and design elements. Even though the currently available hearing aids may do a good job of matching skin tone, they lack design traits that may make a deaf user self-conscious of their disability. For reasons mentioned above, Elen Parry, a student at Manchester Metropolitan University, designed a 3d printed prototype that takes social inclusion to a whole new level. Her earbuds not only provide an aesthetically pleasing style to the wearer but also add a functional upgrade by including an E1 chip receiver and processor that differentiates between background noise and speech, lowering the former and increasing the latter so the user could hear clearly in a loud environment. This function also protects the inner ear and prolongs healthy ear function. Since these earbuds are Bluetooth enabled, multiple people could jump on to the same audio stream. Multiple people in the same group could be listening to different speakers on nearby stages and avoid cross chatter. Ultimately, the idea here is that someone, who has an eye for design, can easily work with other community members and create custom hearing aids or ear buds (or any other device) that can give a stylish boost to assistive technology, improve functionality, and work towards removing social barriers and enhance human ability. 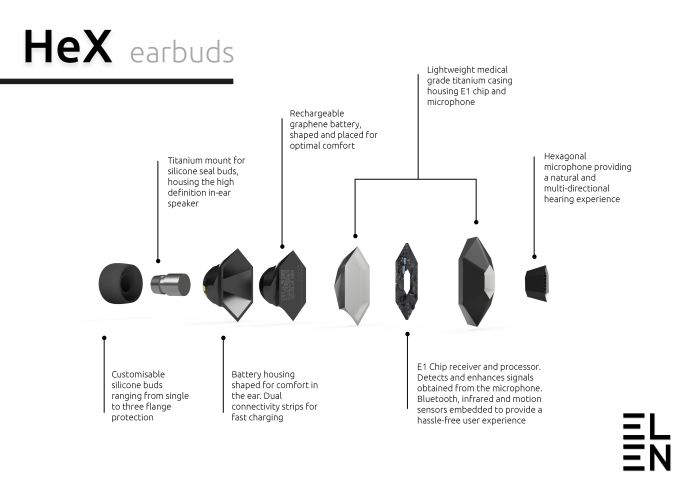 Check out the source links for more information on Elen Parry’s HeX earbuds.